One of those really busy weeks with lots of moving parts. We did push hard and got all the peppers in the ground by Friday, 2600 plants, 26 varieties, 20 beds, hallelujah! The change of seasons is upon us as we mowed down and turned under most of the spring vegetables, all of the over wintered flowers and the scary weeds that accompanied them. The place looks so much better now. We always get behind during blueberry season and this is when we have a tendency to lose some things to the weeds but the weather was just right the beginning of the week and with the extra help of some blueberry pickers we were able to get most everything weeded and cultivated. The rain held off just long enough for us to get the next round of flowers planted too. Six beds of celosia, more zinnias, asters and sunflowers. With any luck we will plant the winter squash today. 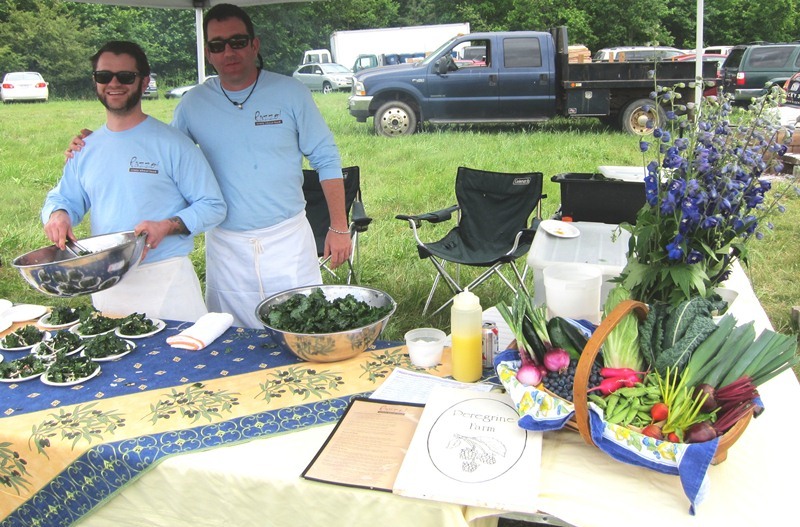 Sandwiched in between was the Farm to Fork picnic on Sunday, which went beautifully. We had a great time with Seth and Thomas from Pazzo restaurant and the torn Lacinato Kale salad with lemon, olive oil, parmesan cheese got rave reviews. The weather was perfect and the nearly 700 guests and volunteers all appeared to really enjoying it. This is the change of seasons from the cool season spring crops to the warm season and this year it appears to be more distinct than usual. With the spring crops being so much earlier than normal the next few weeks will look a bit thin in the produce department until tomatoes really kick in. Never really seen it happen this way before. Blueberries, this is the last week for our variety and not nearly as many as last week. Leeks are back for the next month along with beautiful Escarole. Still a good supply of Lettuce with the crispy and sweet Summer Crisp in Red and Green, some Green and Red Oakleaf and Red Boston too. Round red Radicchio and tall green Sugarloaf Radicchio, great for grilling. The last week for the best Sugar Snap Peas at the market too. The last of the Spinach. The end of the Beets as well- Red, Golden and the striped Chioggia. The last round of the Radishes only the spicy long Chinese. More beautiful Delphiniums this week. The fragrant Oriental lilies in yellow and pink. Snapdragons in great colors. Brilliant long lasting Dianthus. Sunflowers and amazing tall Larkspur. Beautiful Bouquets! Betsy is thinking maybe even the first Hydrangeas! Lovin’ it. Sorry I missed the Farm to Fork, but appreciated the invite. You guys are working hard! !